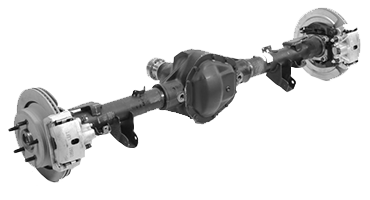 On most vehicles, rear suspension repairs may include parts like a rear differential, universal joints, springs (coil and leaf), rear stabilizer bars, wheel ball bearings/ rear axle bearings, shocks or struts, rear control arms, bushings and rear axles. On vehicles with rear wheel drive vehicles, keeping the differential gears well lubricated is most important. Without proper lubrication the rear end assembly can wear out and lock up and stop your vehicle from moving. With and oil service, lube, and or tire rotation, the rear differential oil can be inspected and changed if necessary to keep the gears inside the differential working properly. The universal joints may require lubrication during an oil service. 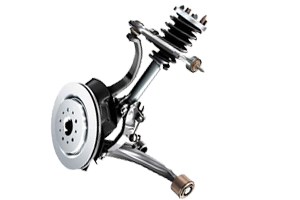 The lubrication of both front and rear u-joints may be necessary to keep the drive shaft in working order and from falling out in extreme cases of wear. Wheel bearings or wheel bearing assemblies should be checked for wear anytime peculiar grinding noises originate from either rear wheel of your vehicle. Burning smells or in extreme cases smoke coming from either rear wheel may indicate the need for immediate replacement of the rear wheel bearings. Certified mechanics at Guy’s Automotive can detect these problems during tire rotation or a vehicle inspection. Struts, or shocks and springs are most important on vehicles especially ones which perform a lot of heavy hauling or towing. Excessive weight can cause premature wear and contraction of rear springs especially with worn out shocks or struts which can be determined upon inspection. Whether you have a newer vehicle with coil springs or struts or an older model vehicle with rear leaf style springs, Guy’s Automotive can fix all styles of rear suspension. The stabilizer bars are instrumental in keeping the rear suspension alignment specifically during the hauling of heavy loads. Torsion bars were invented in the early 1960s by Chrysler to give the rear ends of Plymouth, Chrysler and Dodge vehicles better handling and stability on the rough road surfaces of the time. They were the first stabilizing type bars to be used in the industry for rear ends. They also gained a competitive edge over Ford, Chevy, and GMC trucks with better stability for heavy loads. Now days, many auto makes use these setups to help achieve optimum handling. Guy’s Automotive can diagnose and repair all types of rear suspension problems and get your vehicle back on the road. If you suspect a rear suspension problem, just call Guy’s Automotive and have your vehicle checked and fixed right. We have the tools, equipment and experience to work on all makes and models.